J. Matthew Thomas is director of The PASEO Project, which is hosting its 5th edition of The PASEO Festival in Taos, New Mexico on September 14 and 15, 2018. Thomas is also an architect, artist, collections manager, and community organizer who is dedicated to promoting collaboration between arts and communities to create healthier and stronger creative environments. The Emerging Media Alliance speaks with Thomas about the upcoming outdoor arts and community festival, the interaction between emerging media and the landscape of New Mexico, and essential works of art to experience at this weekend’s event. Read on below, and visit PASEO’s website for detailed information about The PASEO Festival. “The Space Cloud,” an interactive new media installation by Espacio La Nube with Hugo Cifre, Álvaro Gomis García, Miguel Ángel Maure Blesa. Courtesy of The PASEO Project. Emerging Media Alliance: Tell me about the history of PASEO. How did you get where you are today? J. Mattew Thomas: The PASEO started as an event to enhance the Taos Fall Arts Festival by bringing an outdoor component: with projection, installation and performance art. While Taos has a number of artists, a new generation of arts was not able to be displayed in Taos. What started as a small, grassroots event, has now become a year-round 501c3 nonprofit that transforms community with art and art with community. This weekend we will be hosting our 5th PASEO, September 14th and 15th in the streets of Taos [7:00 to 11:00 pm both evenings, free], with 18 installations and over 30 artist from all over the state, nation, and world. EMA: PASEO has become an integral part of the culture surrounding new media arts in New Mexico. Where does the festival plan to go from here? JMT: The PASEO formed into an nonprofit in 2017 called The PASEO Project. The PASEO Project strives to bring year-round programming to the community of Taos, deepening local projects through collaborations and partnerships. In addition to hosting artist residencies for extended periods of time in Taos, we are also working with the Acequia Madre that runs through the historic downtown. We are helping to use art as a tool to help engage, educate, and literally illuminate this historic infrastructure in our town. We are looking at deepening the work of our annual festival into longer term, permanent transformations to our community. “Interium,” a virtual reality experience created by David Stout and Cory Metcalf of Noisefield. Photo courtesy of The PASEO Project. EMA: How do you feel New Mexico supports new and emerging media artists? What makes Taos a perfect incubator for PASEO? JMT: Tradition holds strong in New Mexico and in Taos. But art has always been a universal that has brought people together, from traditions to trade to commerce. We are lucky to live in a town with such a strong support of the arts. The huge success of The PASEO shows that an emerging generation of artists and art fans are coming out to support PASEO and be a part of the next movement of art in Taos. EMA: How can we incubate this influx of emerging media arts in New Mexico? What excites you most about this movement? JMT: How to incubate? I think it’s twofold… funding and education. We need the financial support to bring this work to our communities. As a nonprofit hosting a free event, we are dependent upon state, town, county, and foundation support. We are writing grants year-round to make this happen. It’s a year-to-year gamble that we are willing to make. I think if the support is there financially, the will to educate will become even more pronounced. Our STEMarts @ The PASEO program reaches every high school and middle school in our county. We excite our youth with emerging technologies combined with STEM curriculum. I can only imagine if this was more supported in our state. What excites me most about this movement is the silos it is destroying. The nature of new media is multi-platform and collaborative. We are working with artists that include in their projects local community partners, from an array of backgrounds: environmental, cultural, educational, technological. This brings a diversity of our community to the table. We work with local businesses, nonprofits, other community organizations and government entities. The flexibility of media arts allows these creative tools to mediate, engage, and illuminate an incredible array of important issues in our community. They can be fun, exciting, meaningful and highly receptive. 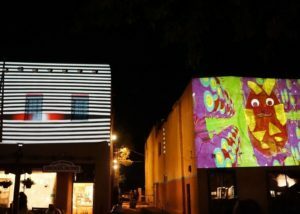 Video art by students of Motomichi Nakamura, projected on buildings in Taos Plaza, 2017. Photo courtesy of The PASEO Project. 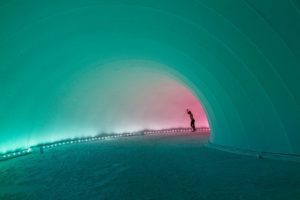 EMA: How does the emerging media art in PASEO interact with the traditional aesthetics of Taos and greater New Mexico? JMT: For PASEO we integrate the art with the community, and we do this with not only the installations being participatory, but in that they are context-responsive. We don’t allow screens or stages; instead the artwork is integrated with the local architecture. This means the work experienced at The PASEO is unique and can not be experience anywhere else. The light tan stucco walls are the perfect background to this media and artists from around the world are excited to come to Taos to share their work. Northern New Mexico is steeped in history and culture, and with that, artists have a lot to react to and work with. Media arts can configure, intertwine, and play with the incredible diversity our part of the world holds. EMA: I know it’s hard to choose… but tell me about one particular work of art that you’re especially excited about this year. JMT: We can’t talk about PASEO 2018 without mentioning The Space Cloud! 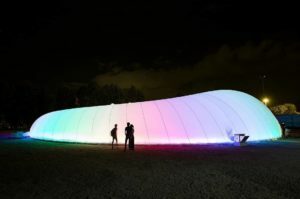 The nexus of this year’s festival, this 8,000-sq ft inflated pavilion is not only a work of art within itself, but will house 7 artists’ installations and performances over The PASEO weekend. The award-winning design was shipped over to the U.S. for its North American debut. Stepping foot into this wonderland of ‘clouds’ is sure to transform our community, transporting them into another reality filled with light, space, and creative spirit. 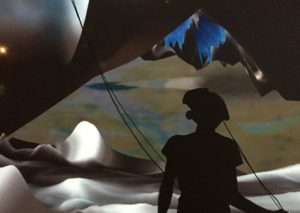 Interior view of “The Space Cloud,” an interactive new media installation by Espacio La Nube with Hugo Cifre, Álvaro Gomis García, Miguel Ángel Maure Blesa. Courtesy of The PASEO Project. The PASEO Festival will take place in Taos, New Mexico on September 14 and 15 from 7:00 – 11:00pm both evenings. There will be multiple free events across Taos’ historic downtown area, including interactive artworks, performances, and several associated events. See EMA’s full September guide of events to read more about these events, and visit PASEO Festival’s website for full details. Follow Emerging Media Alliance on Facebook and Instagram to stay up-to-date with interviews, exciting news, and more.